We've just taken delivery of a new universal gadget mount. And before you start yawning at the thought of yet another windscreen suction mounting solution, bear with me for five minutes as this is a rather special mount. At first glance, Exogear's solution doesn't look that novel. The large wide jaws, lined with polyurethane, are designed to grip a wide range of smartphones and satnavs and the design, using a bulldog clip type arrangement, allows for easy device insertion and removal. It also has a locking swivel so the mount can be used in whichever orientation you choose. All good so far. But the hidden beauty of this mount is it's base. 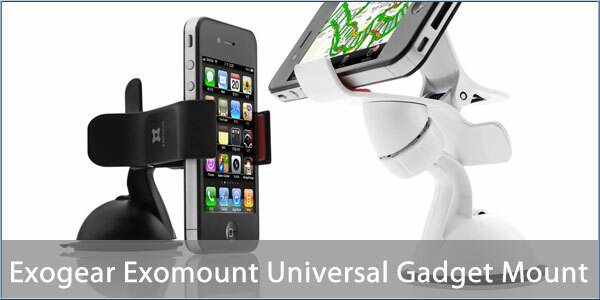 Instead of relying on a basic suction mount as we have seen in a million other mounts, Exogear's Exomount uses an entirely a new design. The base has a soft rubber cushion that uses a special tacky coating to ensure optimal suction. This allows it to work on surfaces that normal mounts would not be able to adhere to. And it works. In fact it works so well that it will hold firmly even before the suction lever is pressed. We will publish a full review in the next few days but this mount is so good that we thought you needed to hear about it ASAP. Available in the UK for £21.99 here. Be sure to take a look at the demo video where it lifts a microwave! That hits me right in my mount addiction. I'm going to have to have one. Thanks for posting the info. Edit: just realised that the clamp makes it difficult to plug in the power lead. So will await a fuller review, which I hope may look at mounting a sat nav 'off-centre'. What they don't emphasize and what I really like is that it works with or without a bumper case and, most interestingly, it's 'reversible' giving so many more mounting possibilities. I don't believe he's referring to an I-Phone. My TT GPS' power connection is on the bottom, middle. That's the interference being commented on. This looks really good and I'm very tempted. My only concern is how much the phone wobbles when the car is moving - one of my pet hates about several other mounts I've tried. complains of exactly that problem, to the extent where it looks like it would be very annoying. Anyone actually got one of these mounts and would like to comment? I got one of these and have only one complaint! The thing may lift a microwave but for goodness sake, don't mount it on the windscreen as the thing drops if you put anything other than a standard phone on it. It will definitely spill your soup! The tightening ring is not that tight!! Returned to a proper Garmin although still have Co-Pilot on a Galaxy S3! Contacted the company who thought it might be duff. Replaced it with another by RMSD and old one being returned. New one much tighter and one of the best sat nav holders I have bought. Exceptional service from this company. Highly recommended. .. New one much tighter and one of the best sat nav holders I have bought. That's really great to hear. Many thanks for letting us know. Buybits now do something similar specifically for satnavs. This is the one for the Tomtom 530. Old subject I know. but thought I'd report as a result of review/comments I have ordered one. The website address has changed but it is top Google for 'Exolife'. Same website address, they've just changed the internal page. The updated the link page is here. Yup, late night browsing - never at my brightest [as you can tell from my posts].